Some people claim to have a “hunger” for knowledge, but have you ever had your hunger fed in class — literally? Twice in less than one week I experienced this very phenomenon in two separate classes. During the first experience — in an “operations management” class on Thursday, July 19, 2012 — I led my students in a gastronomically rewarding “class exercise”: order pizza! We then had to pay for and — most importantly — eat the inventory when it was delivered 30 minutes later. The class consensus: great success! 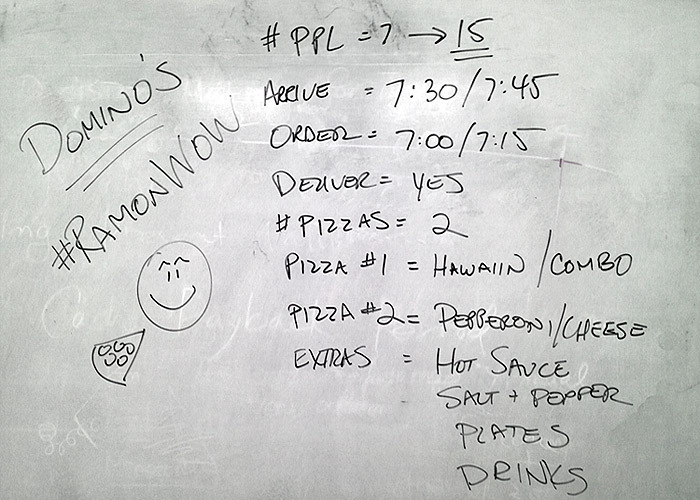 Not only was this in-class exercise a success academically, but since we selected Domino’s Pizza as our supplier, the entire experience was full of the spirit of Ramon De Leon and his famous #RamonWOW! If you’ve somehow never heard of Ramon, consider this: if ever there was a great example of someone whose social media strategy embodies the essence of an individual and his organization, it is Ramon DeLeon. Ramon symbolizes how a small business owner can leverage social media to build a business. Beyond his effervescent presence in Chicago he has spoken at conferences around the world, sharing his infectious energy that he calls #RamonWOW! The second experience occurred on the following Tuesday, July 24, during the last meeting of my buying behavior class at UCSB Extension. In this instance one of my student groups gave an informative brand analysis presentation about Domino’s Pizza — and they even bought pizza for the class! The presentation can be viewed below or directly at SlideShare.net. All things considered it seems that pizza is unquestionably a powerful partner in pedagogy!